The following are reflections from photographer Janet Cruz’s experience capturing images at the National Warplane Museum for DePaul’s Skybird Landing Apartments in Geneseo, New York. 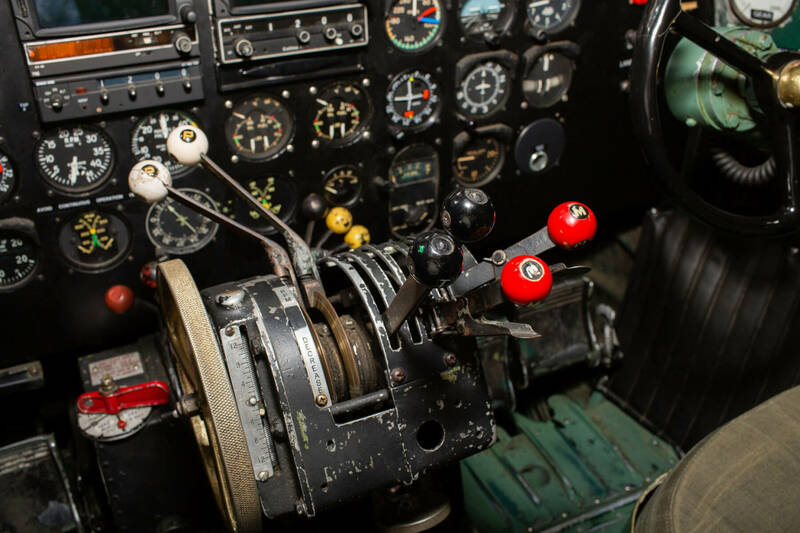 A visit to the National Warplane Museum in Geneseo is a front row seat to World War II history! During my several visits to the museum, I had the opportunity to walk around and speak to the folks volunteering and working on the planes. I quickly learned the history behind the awe-inspiring machines and gained a new understanding and appreciation of the stories, missions and lives of these planes and their crews. The Museum is home to “The Movie Memphis Belle,” a four-engine bomber also known as the flying fortress, not to be confused with “The Memphis Belle, a famous B-17 which flew in every combat zone during World War II. Named after the pilot Captain Robert Morgan’s sweetheart, the original Memphis Belle has been restored and is on display at the National Museum of the US Air Force in Ohio. The name on the plane in The National Warplane Museum in Geneseo is “The Movie Memphis Belle” so there would be no confusion with the original. Known as “The Movie Memphis Belle” due to her starring role in the 1990 film Memphis Belle, the craft is one of approximately 10 B-17’s still flying,” according to the National Warplane Museum’s website. She has served as a VIP transport, a corporate aircraft and spent 15 years as a fire-bomber. Having successfully completed 25 missions, she holds the distinction of never having been out of service in her history. During one visit to the museum, I ended up talking to a volunteer mechanic and pilot at the museum as he was working on one of the Movie Memphis Belle’s engines. He shared a personal experience he’d had sitting in the cockpit of another plane, Whiskey 7. 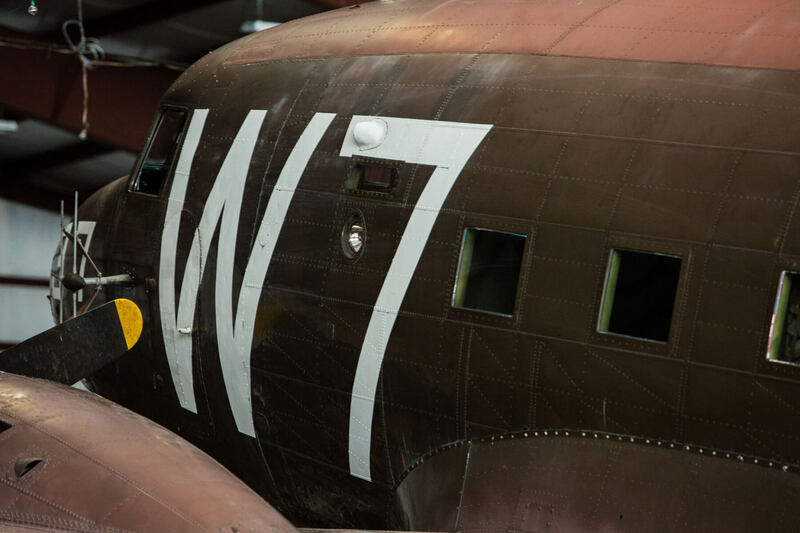 Built in 1943, Whiskey 7 is a C-47 Dakota cargo aircraft that carried 28 soldiers in full combat gear. On D-Day, June 6, 1944, Whiskey 7 was one of the lead aircrafts in the first strike of the invasion over Sainte-Mère-Église, Normandy, according to the National Warplane Museum website. Over 6,000 paratroopers jumped from more than 370 planes on D-Day. After he shared some of the aircraft’s history, the volunteer mechanic encouraged me to actually go into the plane and spend time taking it all in. Sitting in the pilot’s seat was surreal. I couldn’t help but think about each person who stepped foot into this aircraft during WWII as I moved around the plane, wondering what they were thinking and feeling. 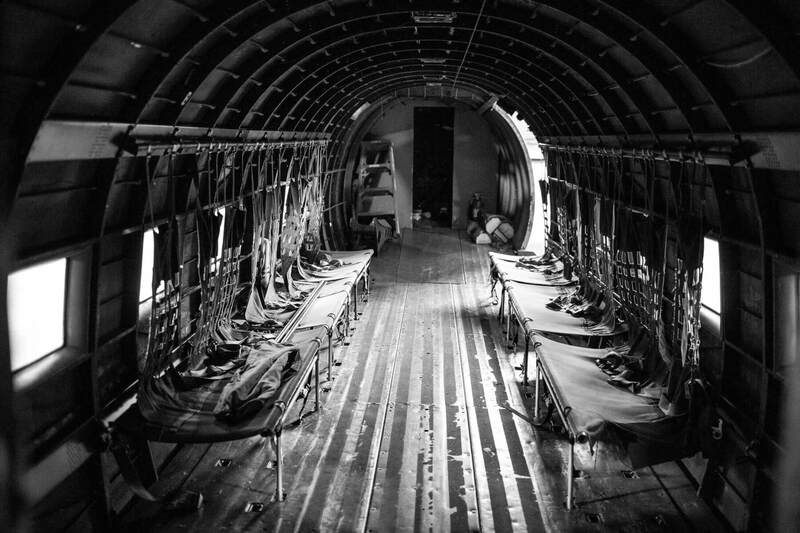 Seated in the paratrooper’s seats looking across to where other paratroopers sat, I tried to put myself in their shoes, waiting to jump into the unknown, uncertain if they would ever see their families again. My time spent at the National Warplane Museum capturing images for DePaul’s Skybird Landing Apartments was very emotional. I really have never spent much time thinking about the realities of combat. Actually being able to touch and photograph such an important piece of history was a humbling experience. I took all these images with great respect for each individual that served our country. These images are dedicated to the men and women on the frontlines in World War II. 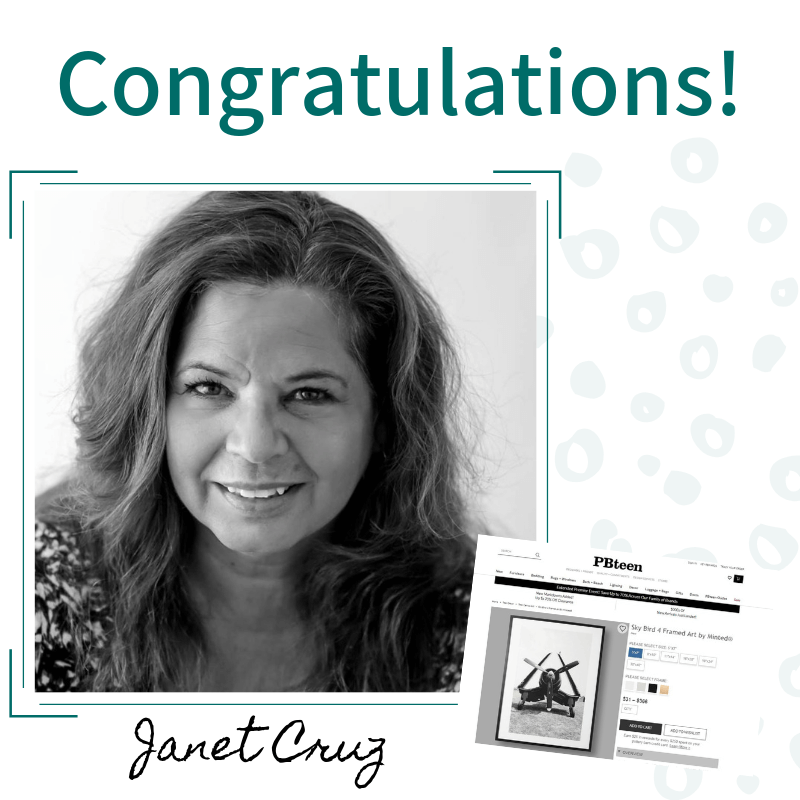 DePaul would like to thank and congratulate Janet Cruz for her dedication to providing inspiring and breathtaking images of history for the newly-opened Skybird Landing Apartments. One of the photos of the Corsair which she captured at the National Warplane Museum’s annual airshow, titled Sky Bird, has been selected by Pottery Barn to be offered for sale online! Congratulations on this well-deserved honor Janet and thank you for helping bring even more awareness to DePaul and those we serve!